Formulate an investigative question for this investigation. 2. 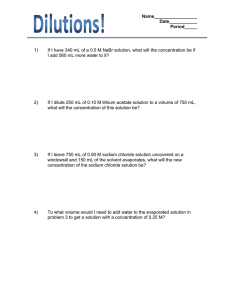 What mass do you need to make 500ml of 0,1M solution of oxalic acid? 3. 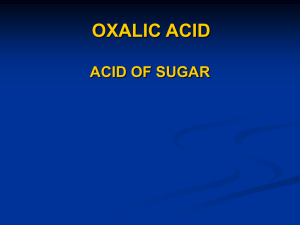 What mass do you require to make 250 ml of 0.1 M solution of oxalic acid. paper. Tare the balance to correct the mass of the filter paper. 5. Carefully pour the measured amount of oxalic acid into the 250 ml volumetric flask. 7. 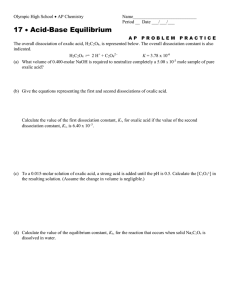 This is your standard solution. What is the meaning of this statement? 1. Fit the burette into the clamp on the retort stand. 2. Use the funnel to pour the sodium hydroxide solution into the burette. the air in the bottom of the burette. Fill the burette to the zero mark. 4. Pipette 25 ml of the standard oxalic acid solution into the Erlenmeyer /conical flask. 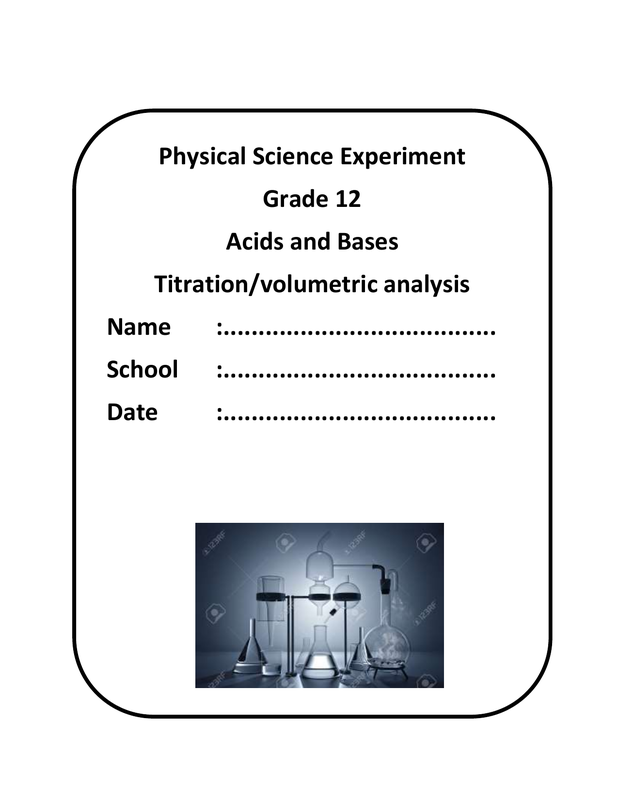 flask to enhance visibility of any colour change during titration. conical flask. Control the tap with your left hand and use your right hand to swirl the flask. the solution turns pale pink and holds this colour for approximately 10 – 15 seconds. considered as the volume of NaOH (aq) needed to neutralize 25 ml of (COOH)2.2H2O. 2. 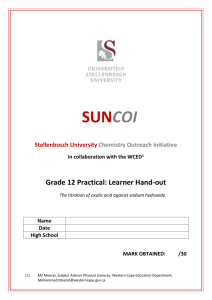 How many moles of sodium hydroxide will react with one mole of oxalic acid? 3. 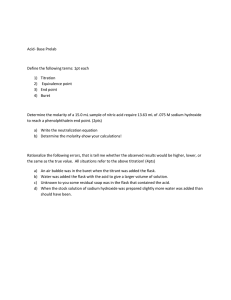 Calculate the number of moles of oxalic acid in the Erlenmeyer flask. 5. 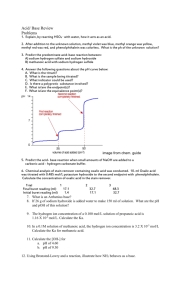 Calculate the concentration of sodium hydroxide solution. 7. 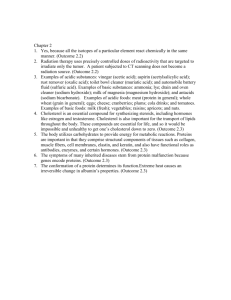 List two factors that could give rise to experimental error. 8. 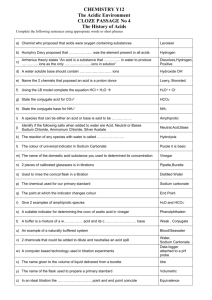 Briefly explain why phenolphthalein is the chosen indicator? 9. What colour is phenolphthalein in and acid medium? 10. 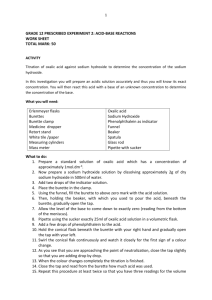 What colour does this indicator display when titration reaches the end point? Titration of oxalic acid against sodium hydroxide.